I’ve been posting about my trip over the weekend to the Berkshires and any good trip includes good food, of course! I wanted to share some of the delicious locations and foods we ate over the weekend. The first evening we were there, we ate at Alta Restaurant & Wine Bar right in Lenox Center. By the way – don’t blink or you’ll miss the center. It’s very tiny! I wanted to take photos of the restaurant, but didn’t want to disturb other diners, so have to be satisfied with the images on their website. It was raining that evening (of course, it’s been raining a lot here recently! ), and the covered porch seating was delightful! The food was quite tasty, including a goat cheese and walnut salad, grilled steak and fries. My friend had the duck and reported that it was quite nice. We ordered wine by the glass and even so, we were shown the bottle and offered a taste prior to making the commitment. A nice touch. On Friday, we visited Edith Wharton’s home and enjoyed a lovely luncheon on the back veranda under a striped awning, overlooking the gardens. I had the delicious tarragon chicken salad on a ciabatta roll with a side of carrot salad and iced coffee while my friend Rob had quiche and lemonade. Tasty! By the way, take note of the herringbone pattern of the brick floor – loved it! The big draw of Lenox and the Berkshires is, of course, Tanglewood! We attended concerts on Friday and Saturday night, dining on the lawn along with thousands of others. Some folks really went all out – including silver candelabra, flowers and lots of food! This image shows the break between the Shed and the lawn seats. At $16, the lawn is a great deal! I would highly suggest the use of the classic little red wagon as both mode of transporting picnic baskets, chairs and food. Plus, it made for an excellent dinner table! For our picnic al fresco, I borrowed a red mini-check tablecloth and napkins from my mother, which I made for her several years ago and did a little shopping at The Christmas Tree shops for some inexpensive dishes, glassware and utensils. I spent less than $20 for the baskets, melamine lobster plates, plastic tumblers (stemmed glasses are too likely to spill! ), silverware and a candle under glass. It made everything so easy (and light!). We dined on baguettes, different cheeses and crackers, apples and wine. Yum! What is it about eating outdoors that makes everything seem so tasty! Here was the table of one of our neighbors. It got a lot of attention from photographers. I loved the sunflowers in a vase. Later in the evening, they had a couple of candles going. The last day we went out for brunch and found ourselves at the Haven Cafe & Bakery. It’s a casual place, bustling with patrons and servers. I forgot to photograph our food prior to eating it, but as you can tell, it was tasty! I had croissant french toast with scrambled eggs (which were cold, unfortunately) and Rob had eggs benedict and hash browns. Even with the cold eggs, yum! I really enjoyed the casual ambiance and simple decor of the restarant. The floor is gorgeous and the chairs were quite beautiful and of higher quality than one normally gets in such a restaurant. How cute is this chandelier?!? And the busy order area. Everything looked so delicious! I hope you enjoyed my dining tour of the Berkshires for this Travel Tuesday post! 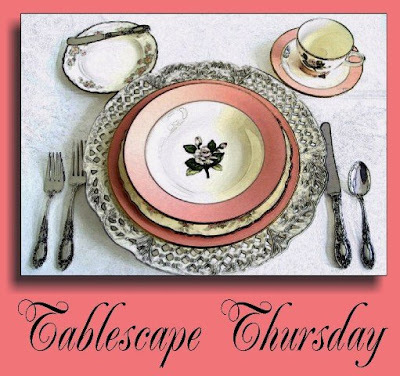 And please enjoy all the wonderful posts over at Between Naps on the Porch’s Tablescape Thursday! Domino Magazine: It’s contest time! Gosh, everything looks lovely and tasty and positively delightful! Just wanted to drop by your blog and say hello. I can't believe I have been in the blog world for 3 years and never discovered your blog. Have I been under a rock? Maybe I did visit at some point in the past but you dropped off the radar. Anyway, wanted to check back and say hello and say that I am enjoying listening to The Skirted Roundtable. I have downloaded them all so far and listen to them on the treadmill at the gym, which improves that otherwise horrid experience immensely. As I told Joni (my hero and blog chum for a long long time! ), I am the only woman on the treadmill fantasizing about butler's pantries or whatever delicious nonsense you girls are on about. I will have to add you to my favorites and come back for more visit. Do come over and say hello if you have a minute, but I imagine you are one busy gal with all your goings on! Love this Travel Tuesday!! !I may or may not have stolen your radio flyer! You reminded me that there are SO many places in this country that I have never seen. Next time I get the itch to travel, I need to remember this! Linda, what a beautiful day you had! Gorgeous weather. What was the temp? love this! it looks so beautiful there. and YOU look so adorable!!!!!!!! Hi Linda, what a fun post. You are so great at pointing out such great detail, I feel like I was right there with you. The weather looked marvelous and seemed like everyone was having a lovely time! Looks like you are having a ball, and the food must be delicious! Linda, I am more than a bit late at commenting here but it really caught my attention so I didn't want to just pass on by. It looks like you had such a nice time here and the weather looks fabulous. All of the details are comfortable decadence if that is possible!